Passionate about Videography? However, you do not go around advertising this quality. Now, its high time to create your video website and breeze along with video upload WordPress themes!! Video WordPress theme lets you create your Youtube like website without any efforts. Not only that, these themes will make your website more interactive with mind-boggling functionalities like Google AMP, instant social share, beautiful layouts and so much more. We’ve skimmed off the best premium video upload WordPress themes that are fully compatible with every browser and works well with any screen size. With the VedioPro WordPress theme, you can build your own video website for any category such as news, entertainment, sports etc. This theme is currently used by a large number of users. The best part of this video upload WordPress theme is that it supports Google AMP and Facebook Instant article. Consequently, your website gets 30% more clicks and shares. It provides an easy to use interface so that your members can easily create their own video channel and playlist. The theme is BuddyPress integrated through which you can follow your members’ activities. You can share the videos on different social media platforms like Facebook, Twitter, Vimeo and so on. Facility to create video series on a single page. Five types of widget styles. Two types of color skins and video layouts. 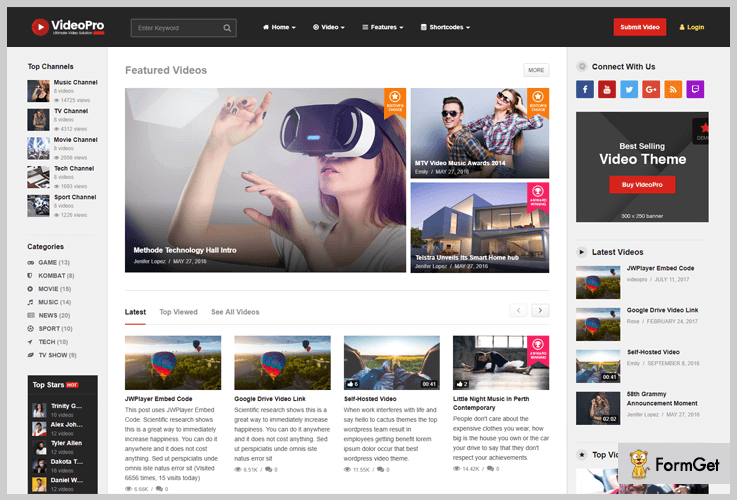 VideoCraft WordPress theme helps you to build a perfect video website in a matter of few minutes. The theme provides effective registration module through which users can register. Then, they are able to embed or upload the video there. You can display the videos from Youtube, Vimeo, and Dailymotion etc or you can just upload your own video. It provides a systematic interface where you can organize your videos in a gallery. Besides this, it also gives you the facility to feature advertisement on your website and earn some bucks from it. This video upload WordPress theme charges you $97, where you’ll get regular product updates and 24×7 support. InfoBar plugin integrated theme, that shows notification bar on the top of the page including email field in order to capture more leads. The theme supports all the popular audio and video formats such as MP3, MP4, Vorbis, FLV, AAC and so on. 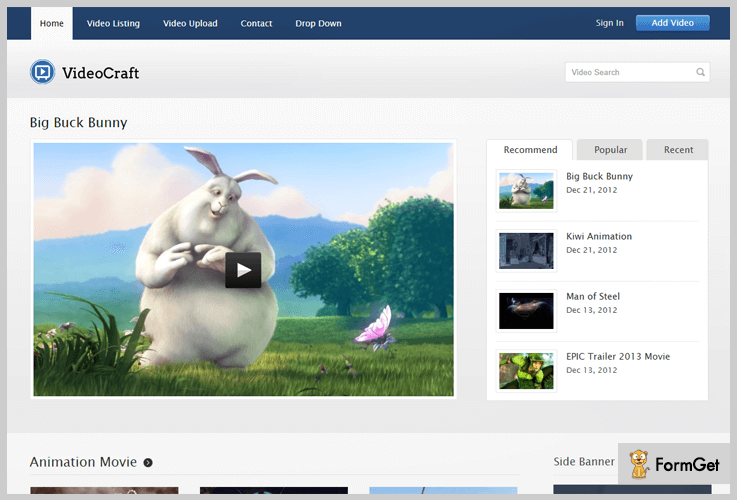 You can use this theme as a video blog where you can share videos with the users. It has an inbuilt Ad module along with 16 editable advertisement banners. VideoMember is perfect for video membership website, if you want to create an online platform to sell your videos. For example, a video tutorial website where you can ask for a membership to access the videos. Then, you can go for this theme because it has an excellent subscription module and it is integrated with PayPal payment gateway. So, you can earn money by selling out your videos. You have an option to import videos from Youtube, Vimeo, Dailymotion like a website. Footer holds additional menu bar and copyright area with brand logo. Beginner Friendly theme options panel. Moreover, you can configure payment terms and period. Different color skins are available in high-resolution colors. Widgetized footer and sidebar. You can customize it as per your need. 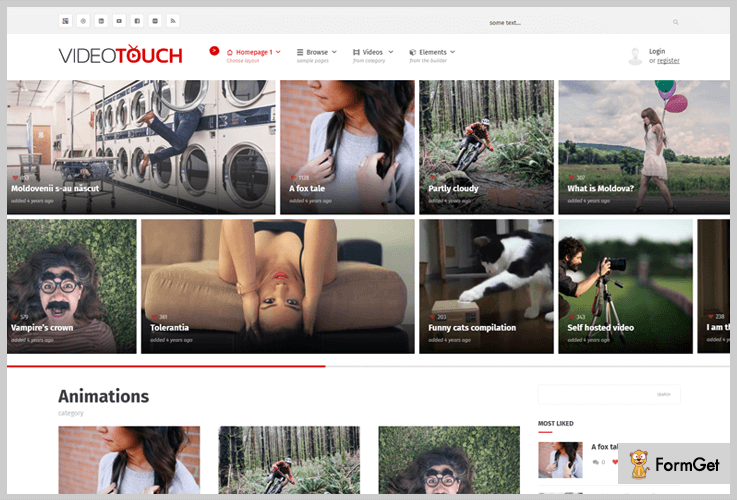 Video Touch is another premium video upload WordPress theme based on Twitter Bootstrap framework. Its TouchSize page builder makes the front end customization so smooth. It is ultra responsive and retina ready. So, your contents and sidebar will look the same way as it looks on the desktop screen. On the homepage, you’ll get a beautiful masonry gallery slider. Additionally, you can display the videos under different categories on the homepage. The theme is WooCommerce integrated so you can sell out your videos also. Get this beautiful video WordPress theme from the themeforest.net at just $64. Infinite layouts and color options are available. So that you can customize it and make it even more attractive. Video drop-down in the menu bar displays videos thumbnails. Sidebar widget to showcase your videos with likes, comment and views options. It also facilitates you with the advertisement facility. You can display ads on the top of the page as well as on the sidebar. The theme also has numerous advanced features such as modal videos, 40+ elements, and mega menus etc. Viduze is basically a video magazine website template which beautifully showcases all your videos and goes well with all screen sizes. Apart from this, this template can be used as a video blogging website with different blog layouts. You can add videos in any way you want i.e., by embedding a code, import it from other sources or you can upload directly. Full-width video slider to showcase your popular videos in the header. Registration module is also available in the theme. 3 column feature section to display your recent uploads. Widgetized sidebar, where you’ll get a search bar, social icons, and tabbed video section. Four column widgetized footer where you’ll get another featured video gallery section. All the above-mentioned video upload WordPress themes rank among all the themes. However, it was our opinion on the WordPress video themes. If you want to explore the themes, have a look at their demo links. 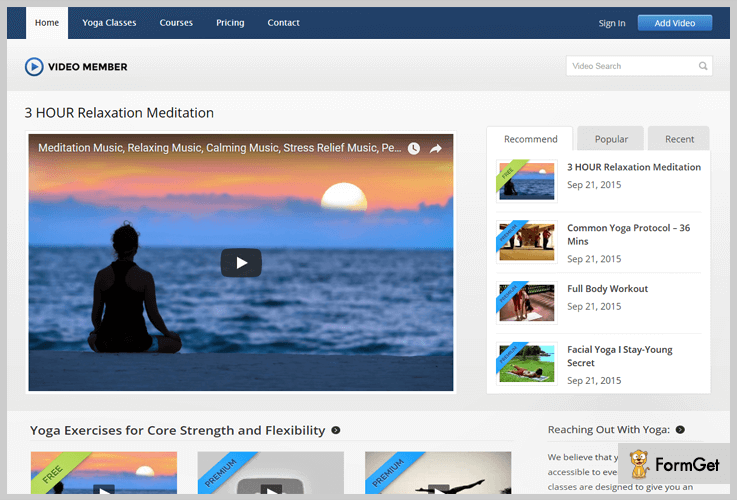 Please share your experience with these video upload WordPress themes. Thanks for reading this article. We highly appreciate it!! !